«One would not believe it is true that the children have to be packed in to a poor, dark, sad and narrow box room, where the bunk beds are placed so close that there is barely space to move between them. ... In local circles one says that there is nothing to do but remaining in silence and make do with until the new boarding school will be finished. .... It is surely not with pleasure the people of the school open the doors do the meager «children's prison» again now after the easter holidays.» This is how the newspaper Altafjord in 1954 describes the conditions at the boarding school in Kautokeino almost ten years after the burning. In large areas of North-Troms and Finnmark many pupils probably experienced similar conditions in the dormitories and schools, in a period lasting up until 15 years. This article is an extract of a longer article in Sami School History 5. 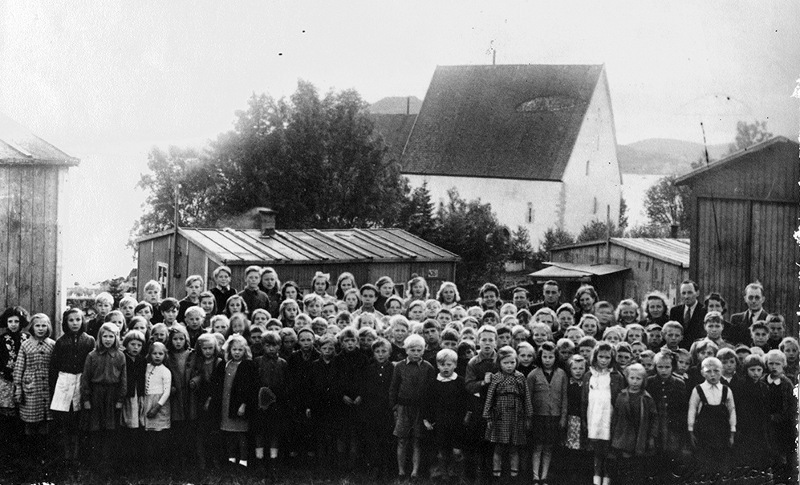 Only 6 governmental boarding schools, 4 municipal boarding schools and 16 other school houses were left in Finnmark after the burning in the autumn of 1944. All of them were in Eastern Finnmark. A few of these buildings had been left relatively unscratched by the war, but most of them were very run-down and some so destroyed that it was necessary to build completely new houses. The few upper secondary schools in Finnmark had also been leveled with the ground. All the three folk high schools had been burned, just as the domestic science school, the agricultural school and the vocational school for fishing industry. About 2/3 of the population of Finnmark and North-Troms had been evacuated to the south, and scattered in virtually the entire country. In the cities and the fishing villages most people had been evacuated, while on the plains most people had went up to the mountains. From the beginning of 1945 many of the children of compulsory school age who had been evacuated were taken into local schools where they had been placed. Many of them spoke Norwegian poorly, and even those who had Norwegian as their mother tongue often had difficulties understanding the local dialects. Everyone could not return north straight away after the liberation. Many stayed in the places they had been evacuated to, until the conditions north had resettled more. Those who had fled to the wilderness naturally did not get any schooling there. They had to wait until the liberation or in many cases even longer before they could get any schooling. Furtherest east in Finnmark some schools had been kept, and some of them were also running almost regularly in the school year 1944/45. 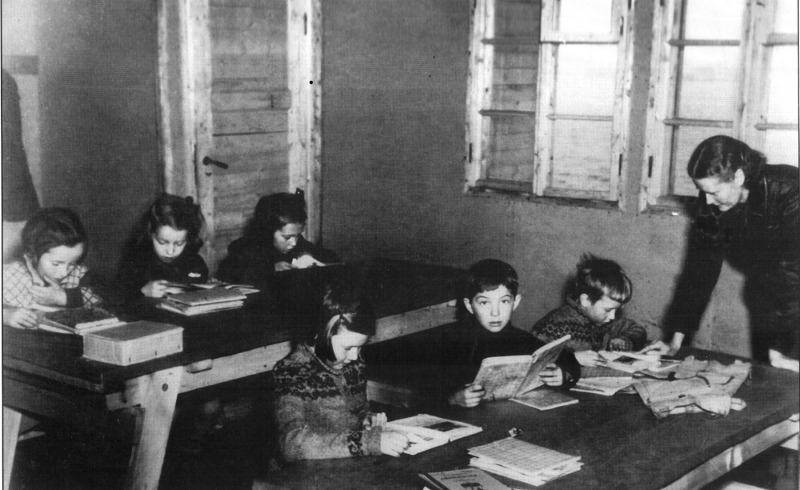 School children from Finnmark in the Trondenes camp. Many of those who had been evacuated returned north as soon as there was peace, but not everybody could return to the evacuated areas straight away. Therefore as many as nine schools for pupils from Finnmark and North-Troms were established. Five of those were in Troms, all of them in barracks left after the occupants. At Trondenes close to Harstad there was a camp with close to 1000 persons, and at the most 180 school children. The camps close to Tromsø had about 120 children in total. The camp in Finnfjordbotn was a boarding school, where the children lived without their families. There were about 200 children at the most. The school camps were marked by great insecurity, which made it difficult to plan and run a school there. The number of pupils varied throughout the year, many left for the north to the areas which were under reconstruction, while others arrived to the camp. The last camp, at Trondenes, was not closed until 1951. As so few schools had been started again in the winter 1945–46, fishing boats travelled the coast of Finnmark to bring pupils to Finnfjord. It was not an easy task to gather children from such a wide area, where the reconstruction of houses, quays and telephone connection had barely started. The director of schools had to make the radio read informations about where and when the boat would pick up children for Finnfjord boarding school. The quality of buildings and equipment in the camps could vary a lot. Finnfjordbotn was probably one of the better ones structurally, as this camp had been constructed for German soliders. Several of the other camps had been constructed as prison camps, and the barracks were very poor. 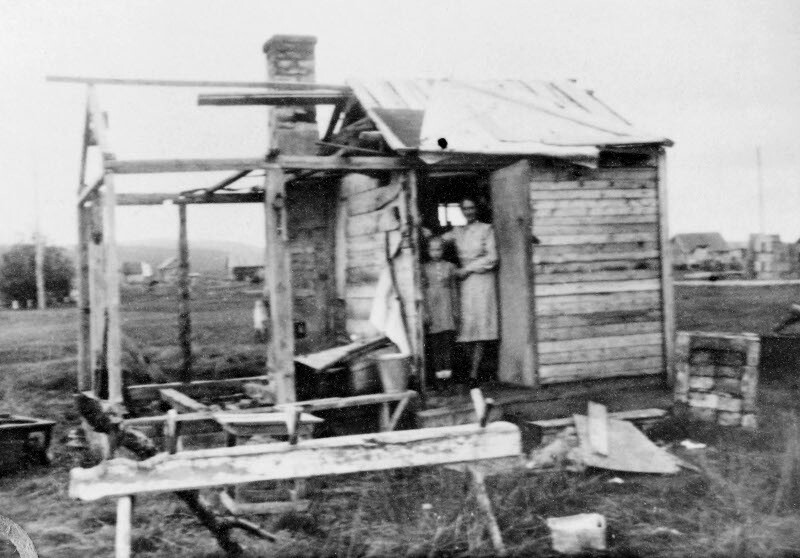 At Sandvikeidet the conditions of the school barracks were so poor that the board of health forbade to use them until they had been renovated. From Trondenes camp the first school headmaster reported that they had a tough struggle to get the school barracks in such a condition that one could teach in them. Equipment and educational books were scraped together from many sides, and the camp schools were given books for their school book collection from the Teacher's Kirkenes-fund. There was also a great lack of clothes and shoes for the children, and the school inspector wrote to the National help to ask for shoes, socks, wind-jackets, sweaters and breeches for the pupils. We have learned that the children of compulsory school age in Brenna and Kjæs will be sent to Finsnes for schooling there. This is something which the authorities should not do to our children. At the district meeting 19-1-46 it was passed unanimously to apply to get a school barrack to Brenna. The application was sent to Kistrand municipal education committee, and the application was granted by the education committee. We were promised a barrack for school house. But now we learn that our children will be sent to school in Finsnes in Tromsø county! At the district meeting of 20/7-46 everybody agreed that none of the parents of the 32 children of compulsory school age will send their children to school in Finsnes. We demand to get a school barrack here, as promised by the municipal authorities. If this can not be taken care of, our children will have to stay at home. We hold on to our previous application, to get a school barrack to Brenna. We assume that the forced evacuation is over now. We have been told that one should take care of the health of the children. But to send the children with a boat or similar, is something which can not bee seen as taking care of their health. Our children are not doing well during such a transport. Our authorities has blamed us, claiming that we have refused to bring the school barrack on shore. But this is not true. We are willing to get a school barrack on shore. As soon as it is sent to Brenna. School barrack in Fuglenes in Hammerfest, autumn 1945. 15.09.1945 the director of schools wrote to the Ministry of supplement and reconstruction: «In the school districts west of Gamvik the school administration is still not up and running and the school will probably not get started there this school year.» Yet there were school in some places already the autumn 1945, and several were started in the spring 1946. It was generally not in separate school buildings, in Máze in Kautokeino for instance the teaching was done in one of the few private buildings that had not been burned. From 1946 on school barracks were set up in many places. Most of the school barracks were put up in a hurry, made of very simple materials and with minimal isolation. The barracks only had regular classrooms, and no laboratories for teaching for instance woodwork, domestic science and physical education. They were only constructed for being temporary solutions, but the time of the barracks would last for longer than most people assumed. In the beginning of 1947 there were constructed or were in construction 70 barracks with 1 to 4 classrooms. The first new-built permanent school building to be made use of was Loppa school, which was inaugurated 2. December 1950. The first permanent boarding schools were inagurated in Karasjok and Børselv in 1951. According to the director of schools' accounts in the radio 01.06.1955 at the time there were 60 permanent school buildings in use, of which 9 were boarding schools. 17 municipal school buildings and 3 governmental boarding schools were under construction, while the construction of 18 municipal schools and 9 governmental boarding schools still had not started. At least 40 % of the pupils in Finnmark were attending school in barracks more than ten years after the liberation. Like other people teachers had to be content with primitive housing conditions in the very first post-war period. Anna Mørk is here in her house in Karasjok, where she lived from the summer 1945 and at least to the end of 1946. The war, the burning and the reconstruction lead to a period of «state of emergency» in the school system which lasted between 10 and 20 years. Through the entire period we can say that many pupils in North-Troms and Finmark got their schooling in poorer material conditions than what was the standard for the rest of the country. When we at the same time take into account the lack of qualified teachers and teaching materials, we can say that this period played a significant part in making the educational level in this area remarkably lower than the average in the country. This in addition to the earlier problems concerning that the content, language and culture in the school was distant from the background of a great part of the pupils. Simultaneous with the reconstruction of the primary school a big development of the offer after the seven mandatory years took place. By 1955 as many as 16 municipalities had introduced the one year continuation school, and half of them had made this year mandatory. The number of "realskoler" had increased from three to ten, and two upper secondary schools and three vocational schools had been started. The state school for fish industry in Vardø was reconstructed, and the state fishermens school was started in Honningsvåg. All of the three folk high schools in the county were reconstructed. The evacuation had a norwegianizing effect, as the evacuated Sami and Kven learned a more correct Norwegian and in that time many switched to talking Norwegian with their children. The function of the school as institution of norwegianization after the war was not so clearly stated anymore, as there was not so eager norwegianizers in the position of director of schools anymore. But the content of the school was not changed. The fact that the language and culture of the school was Norwegian was so established that few questioned it. And when some still did, far from everyone wanted to see any change.